City shares expertise with Transport for London to analyse London Cycle Hire data. City University London's giCentre, part of the City Collaborative Transport Hub, is developing innovative research for public transport professionals. The giCentre - which is involved in high-quality research and education involving the use of Geographic Information (GI) - has combined novel tools for visualising and analysing big data alongside insights into consumer behaviour and preference patterns. Transport for London (TfL) is collaborating with Professor of Visual Analytics, Jo Wood and PhD candidate, Roger Beecham, to analyse data from the London Cycle Hire scheme. The data is helping to validate the team's new techniques. The scientists' initial work has allowed TfL to answer important questions about the barriers and incentives that affect the behaviour of cyclists in London. The City team believes that deeper understanding of this behaviour could offer valuable guidance to other cities around the world as they develop and expand similar schemes, aiming to follow the success of London in boosting cycling uptake. 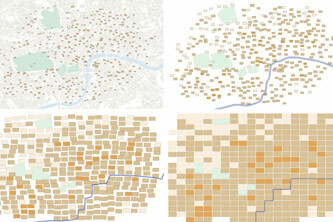 The diagram below maps the transition between geographic and grid views of London Cycle Hire docking station sites. There are three shades of brown indicating the docking station's status in real time: empty, normal and full. 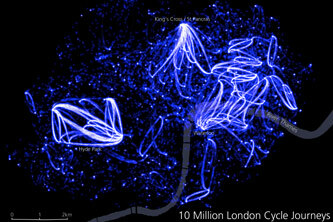 This second diagram below is a still captured from one Professor Wood's videos indicating dominant patterns in the massive numbers of London Cycle Hire journeys (10 million), based on their origins and destinations. "By using visual analytics, the giCentre is developing applications to understand the millions of journeys made by hundreds of thousands of cyclists across London. This allows transport planners and organisations such as TfL to make better informed decisions to support the movement of people around our cities."